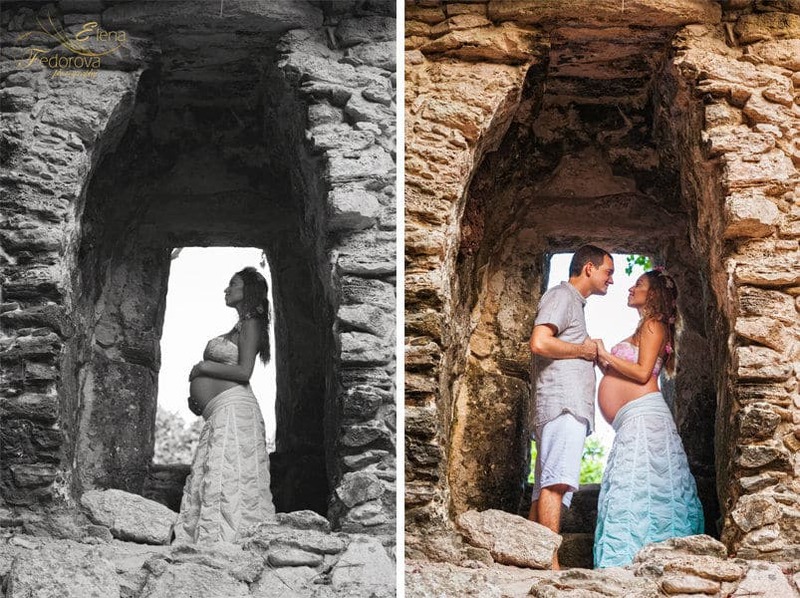 Maternity photos - Playa del Carmen, Mexico. Home page → Blog → Maternity photo sessions → Maternity photo session in Playa del Carmen. Maternity photo session in Playa del Carmen. This summer I made a maternity photo session for a wonderful couple, Eli and Jody. Several days after our session Eli became the mother of a beautiful girl, Isabel, I sincerely want to congratulate her for this wonderful blessing. Nine months of pregnancy pass like one quick moment and thanks to the photographs the memories of such happy period will stay with them forever. The photo session style depends on your wishes, but it is certain that one of the main characteristics defining the maternity photosession will be the romanticism, tenderness and love of this lovely season. Photosets in Playa del Carmen are partly done on the beaches where we can admire the amazing view of the Caribbean sea. The session I made with Eli and Jody, we started first in the tropical forest and then we went to the beach where it was already sunset time which guaranteed us the perfect needed light. You can see the results of this photo session below.